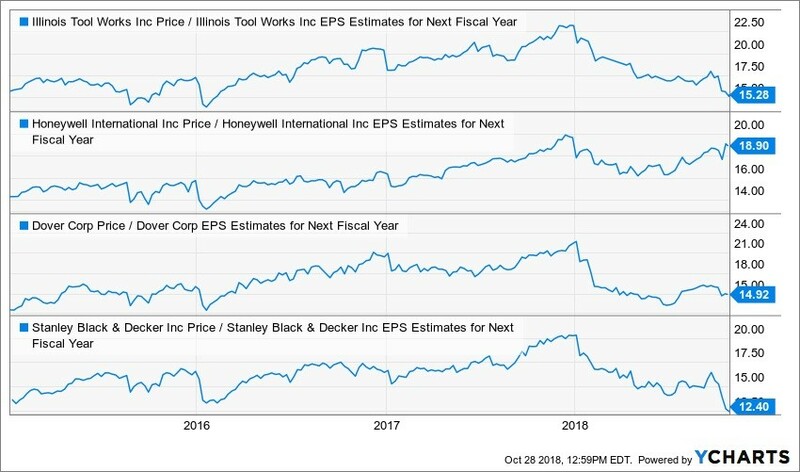 Illinois Tool Works, Inc’s (ITW) stock has increased by 58% over the past five years beating out the S&P 500’s rise of 51%. 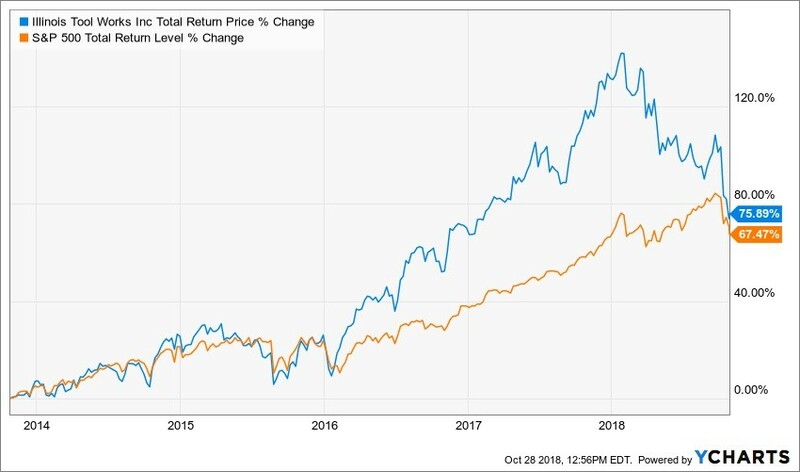 Including dividends, Illinois Tool Works has been able to climb by 76% compared to the S&P 500 Total Return Index rise of 68%. However, the shares have fallen on hard times recently, dropping by 30% from their January 2018 highs. Unfortunately, most of the stocks increase over the past five years has come on a rising PE ratio, also known as multiple expansion. Despite, the company posting stable revenue over the past five years, there has been no growth. There is a silver lining because the shares are now trading at their lowest valuation since 2015. It makes now an ideal time for new investors to start a position in the stock. Meanwhile, the heightened volatility in the market may make writing calls ideal for existing holders. Over the past 5-years -on a trailing-twelve-month basis, revenue has increased by 5% to $14.8 billion through the third quarter of 2018. Analysts forecast revenue to grow by a compounded annual growth rate of 2.6% through the year 2020 to $15.5 billion. 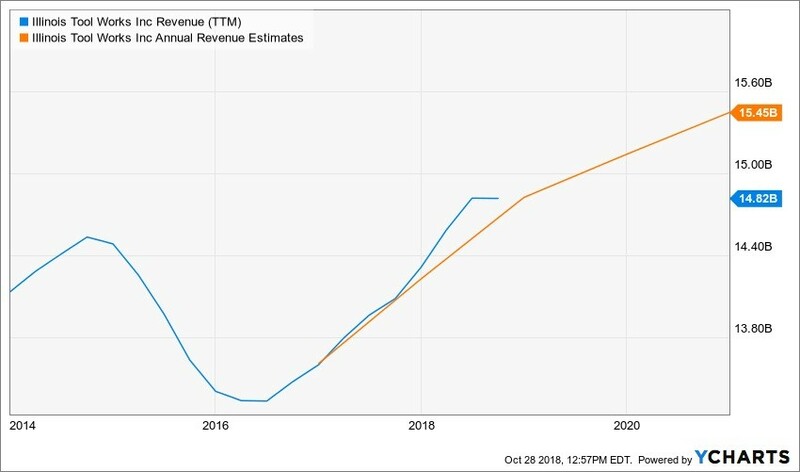 However, despite the stable revenue stream, analysts have cut their estimates since July by 3% for 2019 and 2020. The downward revisions come after the company reported weak third-quarter results with revenue missing forecast by 3%. Analysts estimate that earnings will grow by 15% in 2018 to $7.60. However, that growth is expected to slow in 2019 and 2020 to just 6% each year. Earnings are estimated to rise to $8.12 per share in 2019 and $8.63 per share in 2020. With the stock trading well below its previous highs, the valuation has come down considerably. Since 2015 the shares have traded with a one year forward PE ratio in a range of 13.8 to 23. Now, the stock is trading at 15.3, its lowest valuation since 2016. When considering the company’s compounded annual earnings growth rate, the stock trades with a PEG ratio of 1.6, putting it on the upper end of reasonably valued. Additionally, when compared to its peers such as Honeywell International, Inc. (HON), Dover Corp. (DOV), and Stanley Black & Decker Inc. (SWK) the stock appears to be reasonably valued as well. The dividend has increased by more than 138% over the past five years to a $1.00 per quarter. Meanwhile, given the sharp decline in the stock, the dividend yield has increased to 2.7%. That is nearly 90 basis points greater than the SPDR S&P 500 ETF (SPY) – a proxy for the S&P 500 index. 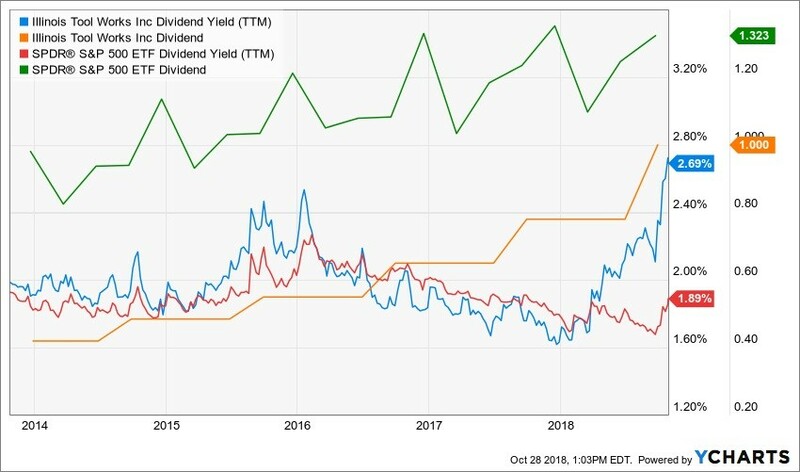 Since 2014 the company’s dividend yield has been in a range of 1.6% to 2.7%. The options in the stock are currently attractive especially given the heightened level of volatility in the stock market in recent weeks. 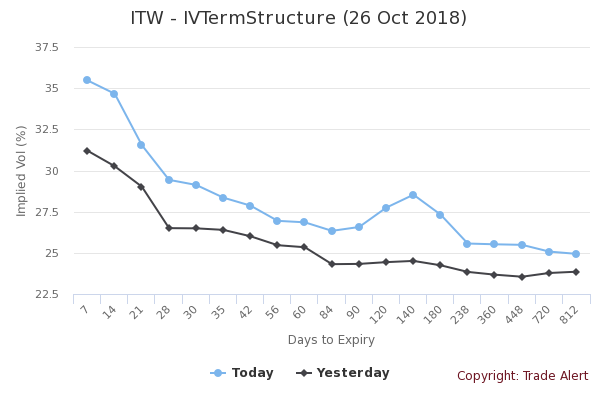 Implied volatility levels for the options expiring on March 15, 2019, are at 28%, which is higher than the S&P 500’s level of 17% for the same expiration date. The heighten volatility levels help to make the vale one would get for writing – also known as selling, a call option greater. The long straddle options strategy suggests that the stock rises or falls by roughly 12% from the $125 strike price. It places the stock in a trading range of $110 to $140 by the expiration date. It makes the current $140 calls for the March expiration attractive to write. It allows the seller of the calls to collect a premium of $1.40 per contract. For example, a shareholder that owns 100 shares of the stock could sell one call contract at that strike price and collect $140, which equates to a return of about 1.1%. The chart shows that stock is now trading well off its highs and is the midst of a sharp downtrend. It is currently sitting at a technical support level of around $121. Should it fall below that support level it could decline to $110.77 an additional decline of 11% from its current price of $124.10. Unless the shares can rise above that downtrend and technical resistance at $136, the risk remains to the downside. It makes writing the $140 March calls attractive. Analysts have slashed their price target on the stock by 21% since the beginning of April. However, they still, forecast the shares to rise to by 13% to an average price target of $140.25. 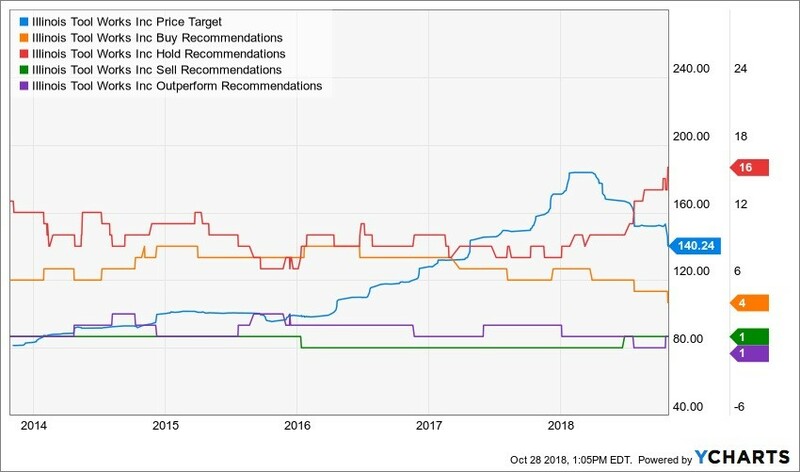 Of the 22 analysts that cover the shares, 23% have a buy or outperform rating, 73% have a hold rating, and 5% have a sell rating. Since the company’s disappointing results some analysts have downgraded the stock and lowered their price targets. For example, Wells Fargo reduced their price target to $145 from $150, noting that revenue for the company was even weaker than expected. Additionally, Seaport Global downgraded the stock to a neutral from a buy and cut its price target to $132 from $170. The firm noted that Illinois Tool was hurt by pockets of slowing international end markets and slower international auto production. For those that already own the stock, the best choice may be to stay the course, collect the dividend, and perhaps write call options when opportunities present themselves. For those looking to get into the stock, the shares are currently trading a low valuation both historical and versus its peers. Despite the current weakness and risk for further declines, with a long enough time frame now might still be a relatively good time to start a position, while trying to buy additional shares should the price continue to fall. This entry was posted on Monday, October 29th, 2018 at 8:38 am and is filed under Stock. You can follow any responses to this entry through the RSS 2.0 feed. Both comments and pings are currently closed.